Performing this drive pattern is one method to simulate the ECM (ECT) malfunction detection conditions. Some DTCs may not be detected through ordinary, everyday driving. Also, DTCs may not be detected through this drive pattern. (1) Warm up the engine sufficiently (engine coolant temperature is 60°C (140°F) or higher). (2) Drive the vehicle when the atmospheric temperature is -10°C (14°F) or higher. Some malfunctions are not detected when the atmospheric temperature is below -10°C (14°F). (1) Drive the vehicle through all the gears. Stop → 1st → 2nd → 3rd → 4th → 5th → 6th → 6th (lock-up ON). 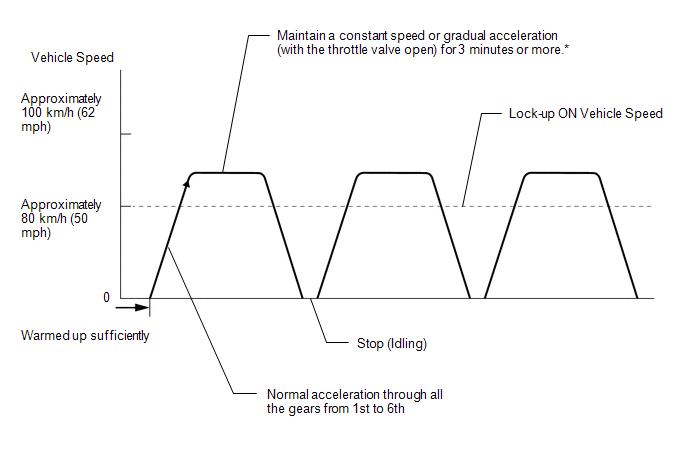 (2) Perform an engine brake test with the shift lever in S. While driving in the S6 range and 6th gear lock-up, move the shift lever to "-" and down-shift from 6th → 5th, 5th → 4th, 4th → 3rd, 3rd → 2nd and 2nd → 1st. Check that engine braking is normal for every down-shift. (3) Repeat the above drive pattern three times or more. When using the Techstream, the monitor status can be checked in the Data List (See page ). *: Drive the vehicle at a speed in top gear that will cause lock-up to engage. The vehicle can be driven at a speed lower than that in the above diagram under the lock-up condition. It is necessary to drive the vehicle for approximately 30 minutes to detect DTC P071000 (No. 1 ATF temperature sensor malfunction).